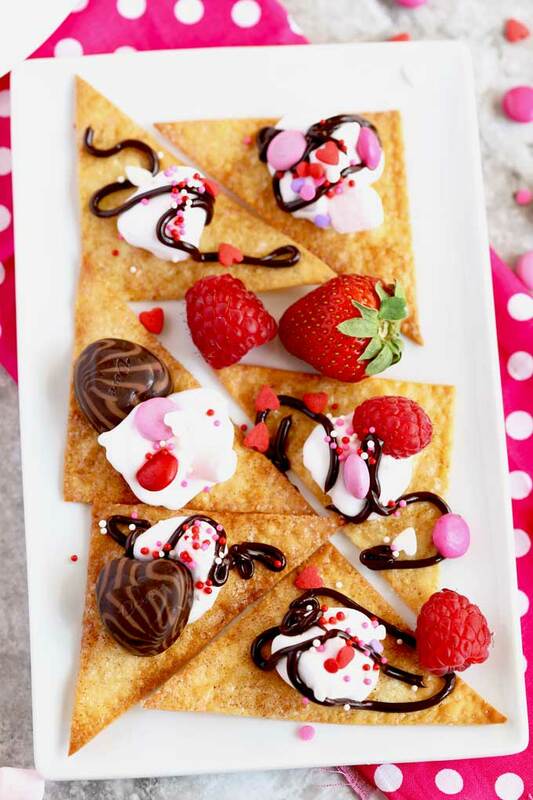 Dessert Nachos made with crispy oven baked cinnamon-sugar wonton chips and topped with whipped cream, fresh berries, chocolate hearts, mini marshmallows, chocolate sauce and lots of sprinkles! 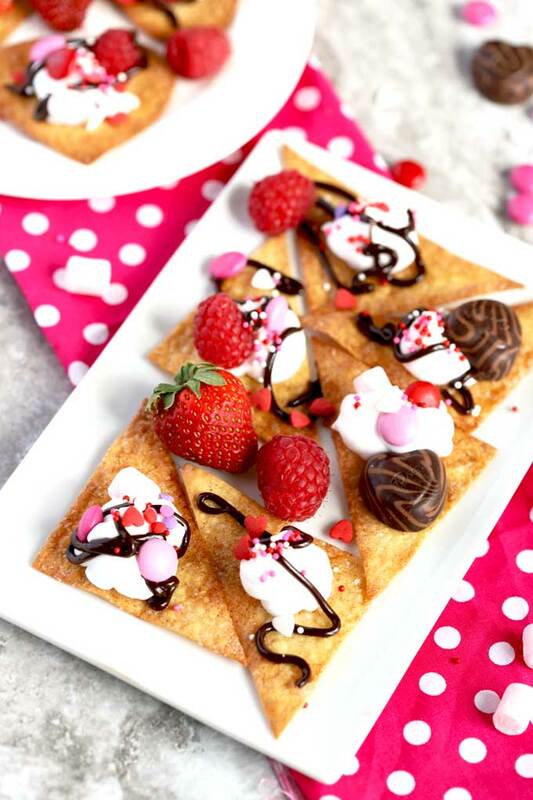 These Dessert Nachos are by far one of the easiest Valentine’s Day desserts I’ve ever made! 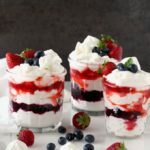 If you are looking for super fun dessert recipes your family and guests will enjoy (and help you make) this dessert recipe is perfect for you. 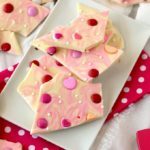 I always like to have a super simple and easy Valentine’s Day recipe like this White Chocolate Valentine’s Day Bark in my repertoire! It is an easy recipe you can make when you get home after spending all day at work. As much as I wish all holidays fell on a Saturday, the truth is not always the case. 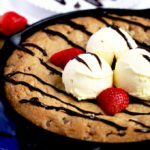 After you come home from work – or if you are a stay at home mom or dad who has done 3 loads of laundry, cleaned up half the house, emptied the dishwasher and run 5 errands throughout the day – the last thing you need is a complicated dessert full of made-from-scratch ingredients. For that reason, I prefer to go super easy and use store-bought ingredients. The best part about this dessert recipe is that you can actually use whatever ingredients you like or have in your pantry. Customize the toppings to your taste and have fun! This recipe calls for wonton wrappers. You could easily use flour tortillas instead. Granulated sugar. Feel free to use brown sugar or a combination of both. Unsalted butter. If all you have is salted butter, that works as well. Berries, Use what’s in season – strawberries, blueberries, raspberries or blackberries. Mandarin oranges are also a good option. M&M candies. I used the Valentine’s edition just for the occasion. Mini marshmallows. I found pink berry-flavored ones. Try to stick with the mini ones. Sprinkles. Pick your favorites and most colorful ones! Whipped cream or whipped topping. Feel free to make homemade whipped cream if you wish. Preheat the oven and line a baking sheet with parchment paper for easy clean up. Place the wonton pieces on the baking sheet and brush each piece with melted butter. Sprinkle the wontons with the cinnamon sugar. Bake for about 5 to 6 minutes or until golden brown and crispy. After minute 5, watch them closely. They get brown quickly! Remove from the oven and place them on a cooling rack. Place the baked cinnamon sugar wonton chips on a platter and top them with whipped cream, berries, candy, sprinkles and chocolate sauce. 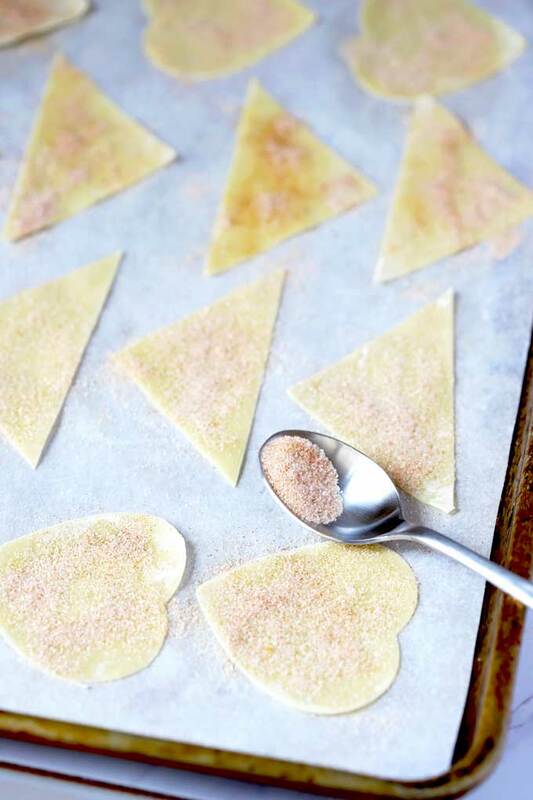 You can bake the wonton chips ahead of time. Store them in an airtight container for up to a day. Do not assemble the nachos ahead of time. The whipped cream and fruit will make them soggy. After adding the toppings you must serve them immediately. 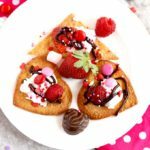 Dessert Nachos are the perfect easy dessert to make when cooking with kids. Have a dessert nacho bar and have all your party guests make their own individual creation! Set all the ingredients on a table and put your guests to work! They will love it. Serve these nachos as a sweet appetizer at a dinner party. I wish I could take credit for this recipe but I got the inspiration from my foodie friend Erin from The Speckled Palate. We are both participating in the Winter edition of Freaky Friday! What is Freaky Friday you may ask? It’s a fun secret recipe swap that a group of food bloggers participates in quarterly. We are secretly assigned another blogger from the group, then we select a recipe from their blog, and make it any way we want! We can keep the recipe as is or we can make it our own! Only after we publish the post we get to find out who made one of our recipes! It was so hard to pick just one dish to make. Erin has so many delicious recipes and I wanted to make them all! Seriously, I went back and forth and finally ended up picking a recipe from a hat because it was impossible to pick just one favorite! Erin loves using fresh seasonal ingredients and enjoys low key entertaining – because sharing food with friends should not be complicated! Like me, she shows her love by cooking and baking for others. Most of her cooking consists of delicious and easy recipes made from scratch. Recipes that are accessible and perfect for people short on time – because from scratch can be easy and fabulous! She loves putting her own spin on classic recipes and admits that cooking makes her happy and helps her relieve stress ( I think we may be related). Take a look at Erin’s great spin on a burger – her Spinach and Feta Burger is such a clever way to elevate a simple classic! Her Instant Pot Creamy Chicken Enchilada Bruschetta is definitely a must and her Chicken and Sausage Gumbo is comfort food to the max! Take a look at this Chocolate Raspberry Overnight French Toast Casserole, a breakfast I would wake up early for! Erin also has some vegan and Whole 30 recipes that look amazing! 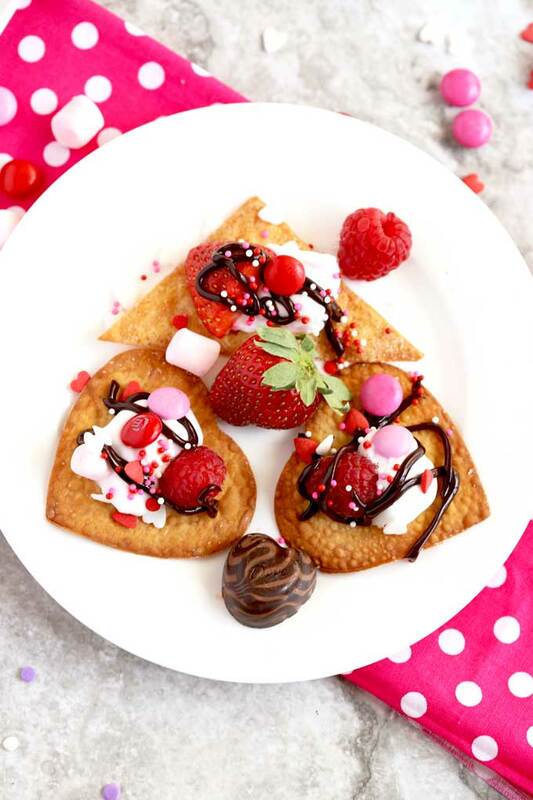 WANT TO TRY THESE VALENTINE’S DAY DESSERT NACHOS? PIN IT TO YOUR DESSERT OR HOLIDAY BOARD TO MAKE IT LATER!! 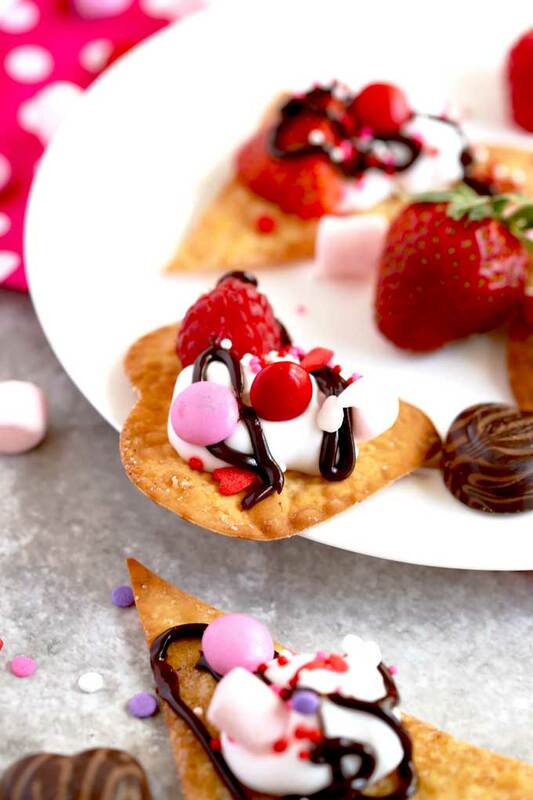 Dessert Nachos made with crispy oven baked cinnamon sugar wonton chips and topped with whipped cream, fresh berries, chocolate hearts, mini marshmallows and lots of sprinkles! Preheat the oven to 400 degrees Farenheit. Line 2 baking sheets with parchment paper. In a small bowl, combine the cinnamon and the sugar. Set aside. Place the wonton halves on the prepared baking sheets spacing them so they don't touch. Brush each wonton half with the melted butter and sprinkle with the cinnamon sugar. Bake for about 5 to 6 minutes or until the wontons are crispy and golden brown. Remove them from the oven and place them on a cooling rack. You may need to repeat the process until all the wonton chips are baked. Place the wonton chips on a platter. Dollop with whipped cream, top with berries, chocolate hearts, mini marshmallows and sprinkles. Drizzle with the chocolate sauce. Serve immediately. My goodness these are such a treat! We avoid going out for Valentines Day – staying in is so much more fun and we get to spend more time together that way. This sweet treat will be a perfect way to end the evening, YUM!!! That’s a nice twist on nachos. I love how cute and decadent these are! 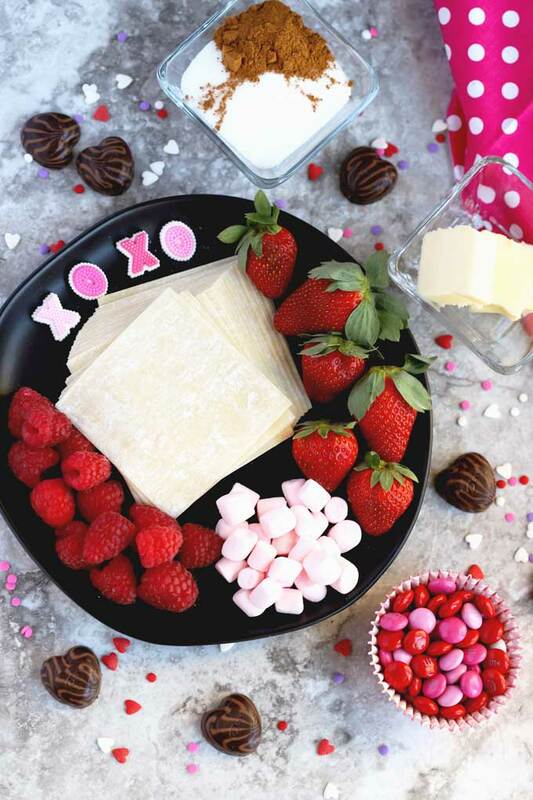 Such a sweet valentines dessert idea! Now these nachos look amazing!!! I love the valentine theme on them! !